Football season is nearly here again and with it comes the excitement of the game, tipping the winners, and going out to matches to support our teams. The thrill of getting out to a game is one that is truly understood by fans, as they join the fun of barracking loudly wearing their colours, heckling the competition and enjoying a footy pie and a beer, or some of the more exciting cuisine now on offer at football games. But while we’re great at supporting the teams that do us proud (or not) each year on the field, we could get a lot better at picking up our rubbish after the game. Overseas, however, there have been some rather extreme incidents of garbage games. In 2013 at Trafalgar Square, around 10,000 beer cans were collected after Scottish soccer fans finished drowning their sorrows in a loss to North-West London. Almost two tonnes of rubbish was cleared from the site. This year at the French Football League, Ligue 1, the game had to be stopped between Lyon and Nice because there was too much paper on the pitch. Officials tried to remove it with leaf blowers to try to resume play. In Canada, at a baseball game, fans were so outraged at a controversial call in a game between the Blue Jays and the Rangers that they began throwing beer cans and rubbish onto the field. But in 2014, Japanese fans shocked spectators at the Fifa World Cup when, even though their team lost to Ivory Coast, they stayed behind after the match to clean up. Gathering up waste after a sporting event is a custom in Japan, and when the fans, all armed with bin bags, set about cleaning their area of the stadium, it made worldwide news. Back home in Adelaide, local Scout groups rally together, volunteering to clean up after SANFL games. The clubs, along with their families, collect up all the rubbish, including the cans and bottles, which they then take to the recycling depot. 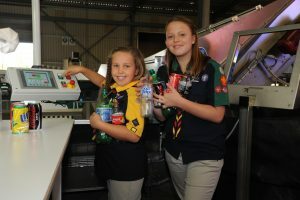 The money the Scouts receive when they collect the refundable recyclables from sports fields goes towards the Scout groups and the upkeep of their halls and other worthwhile ventures. While this is an innovative and efficient way of keeping our communal sporting areas beautiful, the Scouts do encourage spectators to dispose of, and recycle, their own rubbish as part of working towards a more sustainable future for us all.